Every St. Nicholas Day I am reminded of the day I uploaded my first GEDCOM file to Rootsweb’s WorldConnect Project thirteen years ago, on 6 December 2002. I remember the day so well because it was my St. Nick’s gift to friends and family who had helped me get started. To answer the question, all of my ancestors and their descendants put the holidays in my mind. Since 2002 my family tree has grown, my research habits have changed. I’ve continued to share my GEDCOM file and have been writing posts for the 52 Ancestors in 52 Weeks Challenge for the past two years. Today’s post features the last of my known third great-grandparents and the last of my children’s known fourth great-grandparents. My 3rd great-grandfather Jean MAJERUS (1817-1887) was born Saturday, 24 May 1817 in Strassen in the Grand Duchy of Luxembourg to Catharina CORNELY (1794-1871) and Jean Baptiste MAJERUS (1797-1868). Catharina, 22 years old, and Jean Baptiste, 20 years old, had gotten married just in the nick of time on Friday, 25 April 1817, a month before their first child Jean was born. The newlywed father Jean Baptiste complicated things a bit when he reported the birth of his first son. He may have been a bit nervous when he went to the city hall at four in the afternoon. The mother of the child on the birth record was seen as Maria CORNELY instead of Catharina – was it the father’s nervousness or a error made by the clerk? In any case, Jean Baptiste and Catharina’s son Jean was born at 11 o’clock in the morning. His father could not read and write and did not sign the record which was witnessed by two other persons present. Jean lived with his parents and younger siblings in Strassen at the time of the 1843, 1846, and 1847 census. The 1843 MAJERUS household included Baptiste Majerus, Catherine Cornely, and children Jean, Mathias, Baptiste, Pierre, Nicolas, Jean Pierre, Michel, Marie. The head of the household and his two oldest sons were masons. The 1846 MAJERUS household included Jean Baptiste Majerus, Catherine Cornely, and children Jean, Jean, Baptiste, Marie, Pierre, Nicolas, Jean Pierre, and Michel. The head of household and his three oldest sons were masons. The 1847 MAJERUS household included Jean Baptiste Majerus, Catherine Cornely, children Jean, Jean, Jacques, Jean Baptiste, Pierre, Nicolas, Jean Pierre, Michel, and Marie. Only the occupation of the head of household was given, a mason. 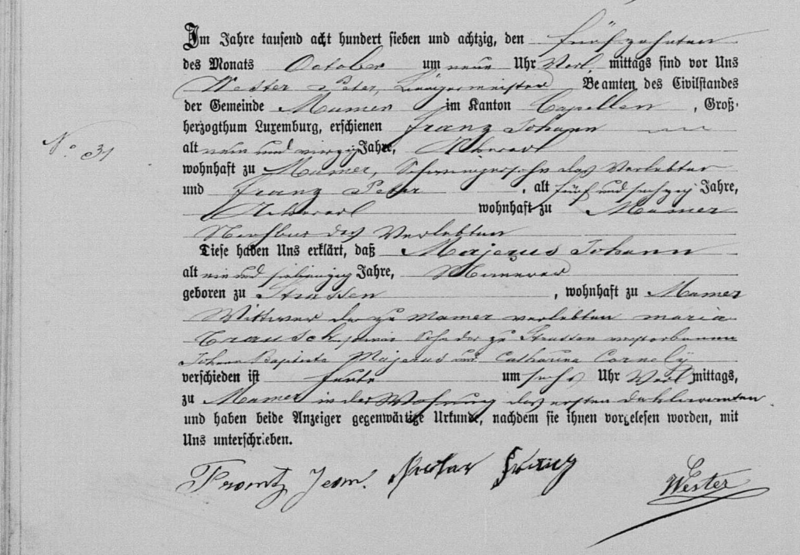 Jean MAJERUS married Maria TRAUSCH (1820-1875) on Thursday, 31 May 1849 in Mamer. Jean and Marie met with Nicolas BORNONG, the mayor of Mamer, at 9 o’clock Thursday morning. The groom Jean was 32 years old and a mason, Maurer. His parents Jean Baptiste MAJERUS and Catherine CORNELY, both from Strassen, were present and consented to the marriage. The bride Marie was 30 years old. Her parents Michel TRAUSCH and Catherine HAMES, both of Mamer, were present and consenting to the marriage. The banns had been published on Sunday the 13th and 20th of the month in Mamer and in Bertrange, the commune Strassen belonged to at that time. The marriage was witnessed by the mayor’s son Nicolas BORNONG, Jean REDLINGER, Michel PESCH, and Paul OLINGER, all of Mamer. The witnesses, mayor, and groom signed the marriage record. The parents of both the groom and bride and the bride declared not being able to write. Jean’s bride Maria TRAUSCH was born Saturday, 19 February 1820 in Mamer to Michel TRAUSCH (1792-1869) and Catharina HAMES (1789-1864). 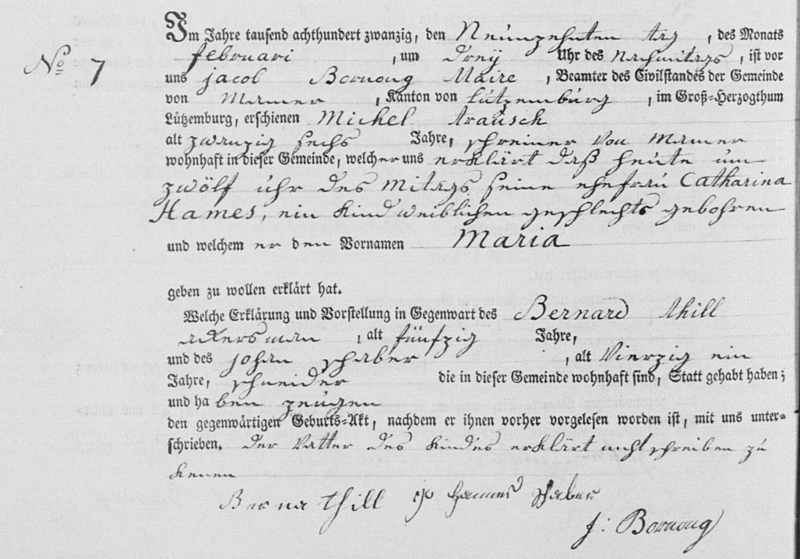 At the time of her birth, the mayor of Mamer was Jacob BORNONG, the father of Nicolas BORNONG who would perform the marriage ceremony in 1849, and the grandfather of Nicolas BORNONG who would witness the marriage. Maria’s father, after reporting the birth to Jacob BORNONG, declared not being able to write and the birth record was signed by the mayor and two witnesses. Maria was their second child but grew up as the oldest of six as the first born daughter died a week after her first birthday. At the time of his marriage to Maria TRAUSCH, Jean MAJERUS moved permanently from Strassen to Mamer. 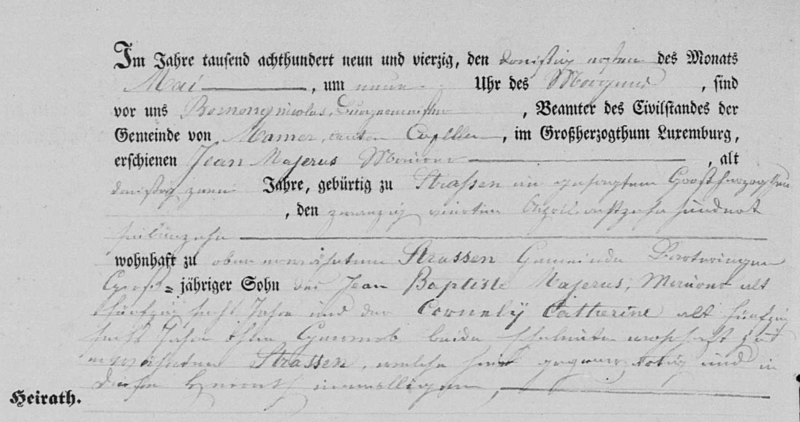 The entry in the parish register of families in Mamer shows in the far right column that he came from Strassen. 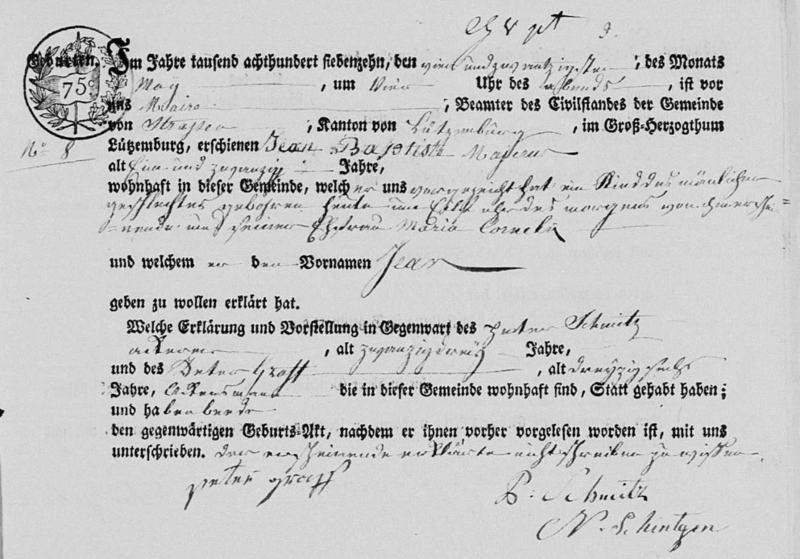 In 1849 when the census was enumerated Jean and Maria were living with her parents in Mamer. The household included Michel TRAUSCH, wife Catherine HAMES, daughter Marie TRAUSCH, son-in-law Jean MAJERUS, son Peter TRAUSCH, and daughter Susanne TRAUSCH. 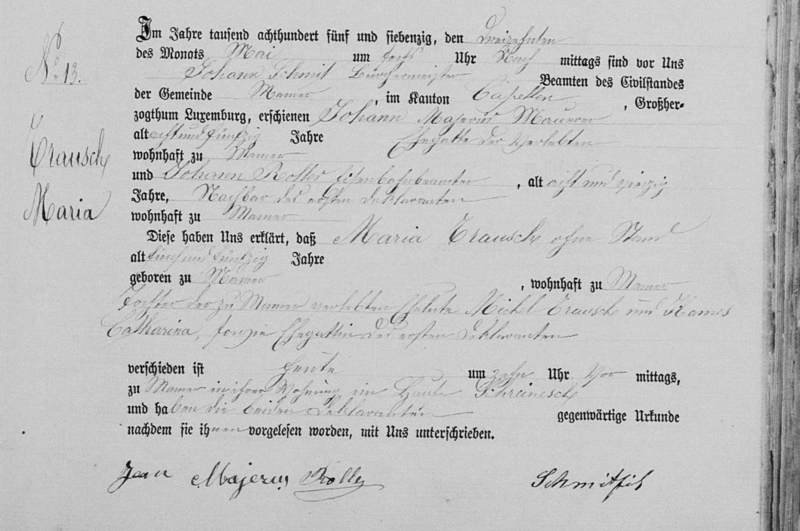 Jean and Maria welcomed their first and only child Marie “Maria” MAJERUS (1850-1931) into the little family on Wednesday, 19 June 1850 in Mamer. It was two o’clock in the afternoon when Jean, age 32, reported the birth of his daughter Marie to the mayor Nicolas BORNONG. Marie was born at noon the same day to Jean’s wife Maria TRAUSCH, age 30. Nicolas BORNONG, the son of the mayor, and Peter GOUDEN were witnesses to the birth report. Jean, Maria, and their daughter Marie continued to live with Maria’s parents in the TRAUSCH-HAMES household in 1851, 1852, 1855, 1858, and 1861. The Michel TRAUSCH home was given the house name Schreinisch as his occupation was carpenter or Schreiner. Maria’s mother Catharina HAMES died Tuesday, 22 November 1864 in Mamer. The widower Michel TRAUSCH was seen as the head of household in 1864 with Jean, Maria, and Marie and then as part of the MAJERUS-TRAUSCH household in 1867. They were still living in the house named Schreinisch. 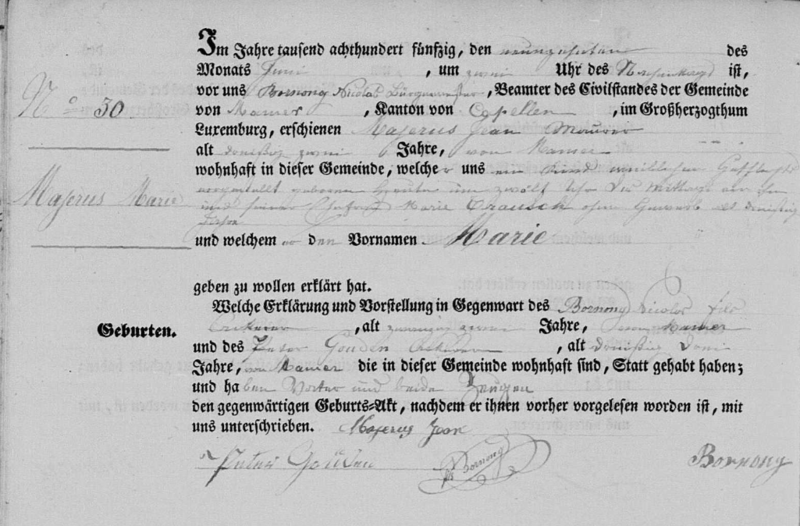 Jean and Maria’s only child Marie “Maria” MAJERUS married Jean “Johann” FRANTZ (1837-1929) on Wednesday, 16 February 1870 in Mamer. Jean’s mother Catharina CORNELY died Saturday, 10 June 1871 in Strassen. 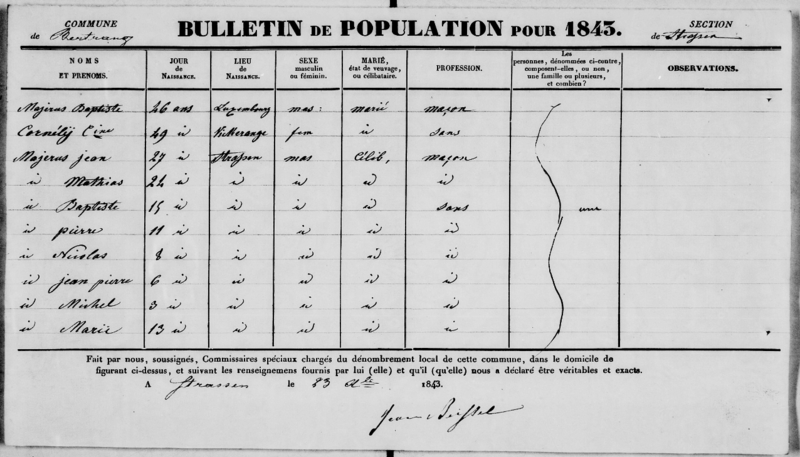 At the end of the year when the 1871 census was taken Jean MAJERUS, wife Maria TRAUSCH, daughter Marie MAJERUS, son-in-law Jean FRANTZ, and first grandchild Maria FRANTZ were living together in one household. The name of the house was no longer given but they were still living in the same house as seen in the death record below. Maria TRAUSCH died at 10 o’clock the morning of Thursday, 13 May 1875 in her home, in a house named Schreinesch in Mamer. This was the home she shared with her parents while growing up and with her husband and daughter Marie. Her widower was listed as the head of household in 1875 with his daughter, her husband, and three granddaughters. Jean MAJERUS most likely did not move out of the home he lived in since his marriage. He remained with his daughter and her family in what was now known as the FRANTZ-MAJERUS household in 1880, 1885, and 1887. Jean MAJERUS died at 6 o’clock the morning of Saturday, 15 October 1887 in Mamer. His son-in-law Johann FRANTZ reported the death three hours later. He left his only daughter Marie, her husband and seven grandchildren. Eleven months later the last grandchild was born. 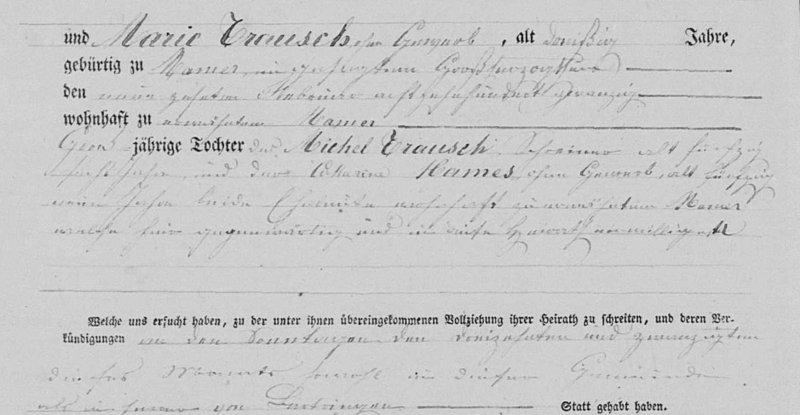 Did the TRAUSCH-HAMES, MAJERUS-TRAUSCH, and FRANTZ-TRAUSCH families live in the same home, a house named Schreinisch, from 1817 when the first couple married until 1931 when Marie MAJERUS died? It would be interesting to learn how to find the answer to this question. Family history research will never be finished or ready to publish. Share what you have, make corrections and additions, write about your ancestors. Yes, it probably will remain a work in progress or a draft of a family book. By sharing what you think is incomplete you may reach someone who has the missing information or the key to open the door in your brick wall. Luxembourg, Registres d’état civil, 1662-1941 (images), FamilySearch (original records at Luxembourg National Archives, Plateau du Saint-Esprit, Luxembourg), Strassen > Naissances, mariages 1796-1823, 1850-1890 > image 214 of 1464. 1817 Birth Record No. 8. (https://familysearch.org/pal:/MM9.3.1/TH-266-12588-61261-75?cc=1709358 : accessed 27 March 2010). Note: mother listed as Maria Cornely. Ibid., Strassen > Naissances, mariages 1796-1823, 1850-1890 > image 1000 of 1464. 1817 Marriage No. 4. (https://familysearch.org/pal:/MM9.3.1/TH-266-12588-58675-14?cc=1709358 : accessed 2 December 2015). Luxembourg, Volkszählungen 1843-1900 (images), FamilySearch (original records at Luxembourg National Archives, Plateau du Saint-Esprit, Luxembourg), Bertrange > 1843 > image 406 of 407. Majerus-Cornely household. (https://familysearch.org/pal:/MM9.3.1/TH-1942-32355-17013-8?cc=2037957 : accessed 30 November 2015). Citing: Baptiste Majerus, Catherine Cornely, and children Jean, Mathias, Baptiste, Pierre, Nicolas, Jean Pierre, Michel, Marie. Ibid., Bertrange > 1846 > image 295 of 431. Majerus-Cornely household. (https://familysearch.org/pal:/MM9.3.1/TH-1951-32358-11288-83?cc=2037957 : accessed 2 December 2015). Citing: Jean Baptiste Majerus, Catherine Cornely, and children, Jean, Jean, Baptiste, Marie, Pierre, Nicolas, Jean Pierre, and Michel. Ibid., Bertrange > 1847 > image 41 of 448. Majerus-Cornely household No. 202. (https://familysearch.org/pal:/MM9.3.1/TH-1961-32349-21532-74?cc=2037957 : accessed 2 December 2015). Citing: Jean Baptiste Majerus, Catherine Cornely, Jean, Jean, Jacques, Jean Baptiste, Pierre, Nicolas, Jean Pierre, Michel, and Marie. Luxembourg Civil Records, Mamer > Mariages 1838-1890 Décès 1796-1880 > image 114 of 1497. 1849 Marriage Record No. 19. (https://familysearch.org/pal:/MM9.3.1/TH-266-12143-120796-17?cc=1709358&wc=9RY3-VZ9:130065401,130130201 : accessed 6 September 2014). Ibid., Mamer > Naissances 1796-1833 > image 337 of 549. 1820 Birth Record No. 7. (https://familysearch.org/pal:/MM9.3.1/TH-267-12667-22797-81?cc=1709358 : accessed 22 August 2011). Luxembourg, registres paroissiaux, 1601-1948 (images), FamilySearch (original records at Luxembourg National Archives, Plateau du Saint-Esprit, Luxembourg), Mamer > Baptêmes 1718-1940, familles alphabétique > image 181 of 375. 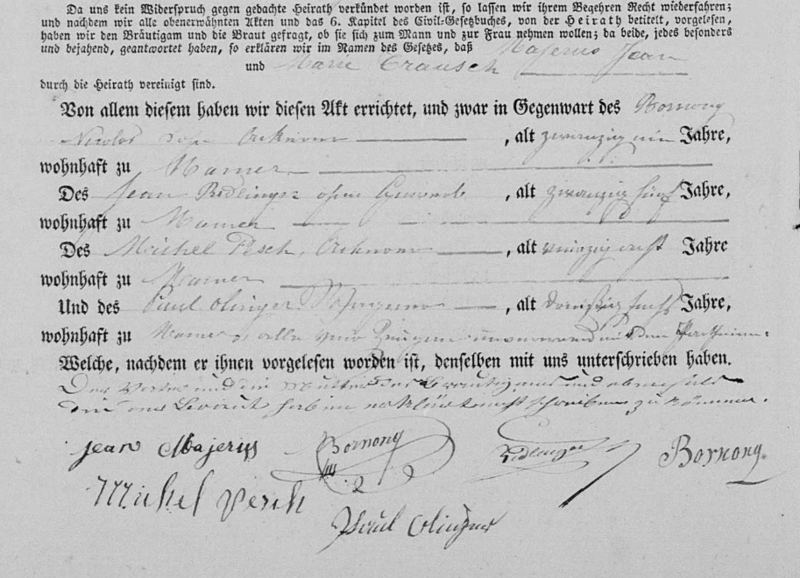 Majerus-Trausch family register pg. 252bis-253. (https://familysearch.org/pal:/MM9.3.1/TH-1951-32401-19204-33?cc=2037955 : accessed 27 November 2015). 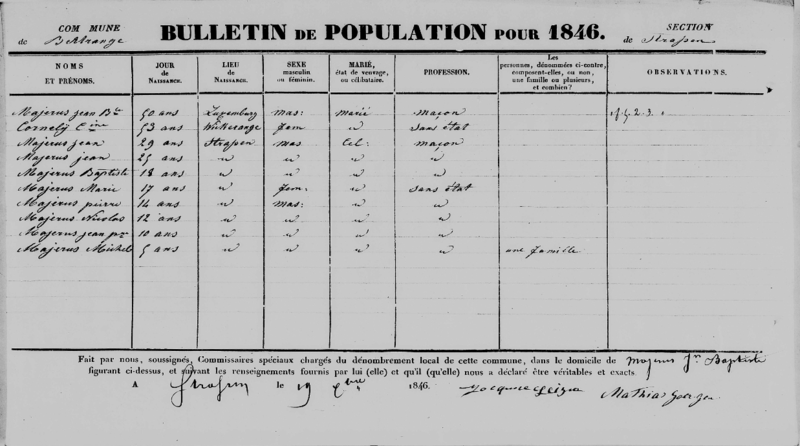 Luxembourg Census Records, Mamer > 1849 > image 299 of 307. Trausch-Hames household No. . (https://familysearch.org/pal:/MM9.3.1/TH-1942-32349-13221-98?cc=2037957 : accessed 1 December 2015). Citing: Michel Trausch, wife Catherine Hames, daughter Marie, son-in-law Jean Majerus, son Peter, daughter Susanne. Luxembourg Civil Records, Mamer > Naissances 1834-1890 Mariages 1796-1837 > image 311 of 1504. 1850 Birth Record No. 30. (https://familysearch.org/pal:/MM9.3.1/TH-266-12585-50928-75?cc=1709358&wc=9RY7-FM9:130065401,130365601 : accessed 27 March 2010). 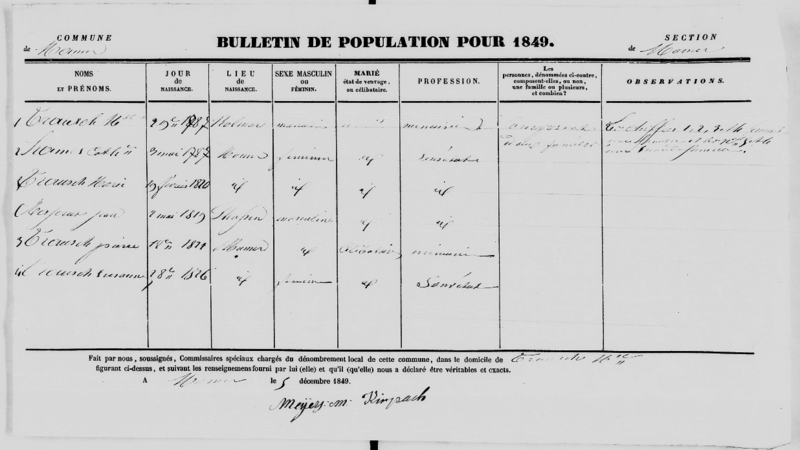 Luxembourg Census Records, Mamer > 1851 > image 314 of 329. Trausch-Hames household No. . (https://familysearch.org/pal:/MM9.3.1/TH-1951-32381-11079-75?cc=2037957 : accessed 1 December 2015). Citing: Michel Trausch, wife Catherine Hames, children Peter, Elisabeth, Susanne, Catherine, son-in-law Jean Majerus, daughter Marie Trausch, and granddaughter Marie Majerus. Ibid., Mamer > 1852 > image 274 of 332. Trausch-Hames household. (https://familysearch.org/pal:/MM9.3.1/TH-1951-32371-19724-61?cc=2037957 : accessed 1 December 2015). Citing: Michel Trausch, wife Catherine Hames, son Peter, daughters Elisabeth and Susanna, son-in-law Jean Majerus, daughter Marie, granddaughter Marie. Ibid., Mamer > 1855 > image 120 of 335. Trausch-Hames and Majerus-Trausch household. (https://familysearch.org/pal:/MM9.3.1/TH-1971-32369-2989-18?cc=2037957&wc=M5LY-VZ4:345860401,345866501 : accessed 30 November 2015). Citing: Michel Trausch, wife Catherine Hames, son Peter, son-in-law Jean Majerus, daughter Marie, granddaughter Marie. Ibid., Mamer > 1858 > image 28 of 356. Majerus-Trausch household No. 27. (https://familysearch.org/pal:/MM9.3.1/TH-1971-32380-8908-57?cc=2037957 : accessed 30 November 2015). Citing: Jean Majerus, wife Marie Trausch and daughter Marie, father-in-law Michel Trausch and mother-in-law Catherine Hames. Ibid., Mamer > 1861 > image 19 of 357. Trausch-Hames household No. 25. 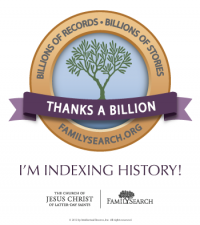 (https://familysearch.org/pal:/MM9.3.1/TH-1951-32379-35011-27?cc=2037957 : accessed 30 November 2015). Citing: Michel Trausch, wife Catherine Hames, son-in-law Jean Majerus, daughter Marie Trausch, and granddaughter Marie Majerus. Luxembourg Civil Records, Mamer > Mariages 1838-1890 Décès 1796-1880 > image 1250 of 1497. 1864 Death Record No. 19. (https://familysearch.org/pal:/MM9.3.1/TH-266-12143-121075-9?cc=1709358 : accessed 22 August 2011). 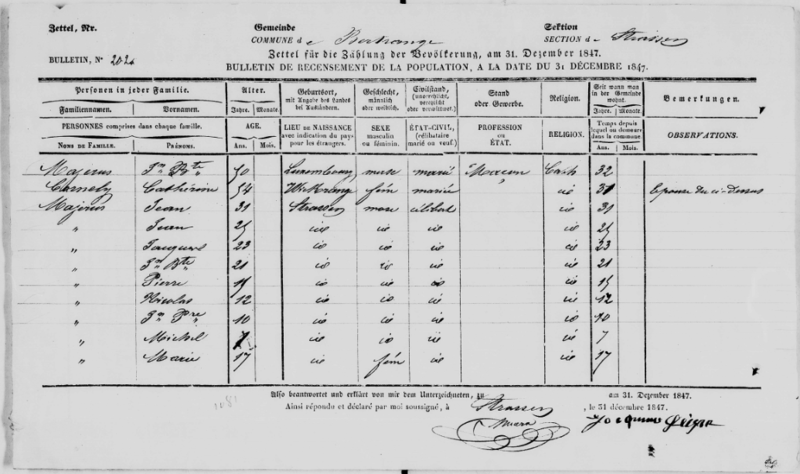 Luxembourg Census Records, Mamer > 1864 > image 267 of 380. Trausch-Hames household No. 120. (https://familysearch.org/pal:/MM9.3.1/TH-1971-32379-10200-26?cc=2037957 : accessed 30 November 2015). Citing: Michel Trausch, son-in-law Jean Majerus, daughter Marie Trausch, and granddaughter Marie Majerus. Ibid., Mamer > 1867 > image 298 of 372. Majerus-Trausch household No. 102. (https://familysearch.org/pal:/MM9.3.1/TH-1961-32377-13108-85?cc=2037957 : accessed 1 December 2015). Citing: Jean Majerus, wife Marie Trausch, daughter Marie Majerus, and father-in-law Michel Trausch. Luxembourg Civil Records, Strassen > Décès 1850-1890 > image 185 of 446. 1868 Death Record No. 13. (https://familysearch.org/pal:/MM9.3.1/TH-267-11740-162036-71?cc=1709358 : accessed 22 August 2011). Ibid., Mamer > Mariages 1838-1890 Décès 1796-1880 > image 1336 of 1497. 1869 Death Record No. 34. (https://familysearch.org/pal:/MM9.3.1/TH-266-12143-119820-91?cc=1709358 : accessed 22 August 2011). Ibid., Strassen > Décès 1850-1890 > image 224 of 446. 1871 Death Record No. 30. (https://familysearch.org/pal:/MM9.3.1/TH-267-11741-2453-64?cc=1709358 : accessed 22 August 2011). Luxembourg Census Records, Mamer > 1871 > image 517 of 840. Majerus-Trausch household No. 56. (https://familysearch.org/pal:/MM9.3.1/TH-1951-32379-27646-49?cc=2037957&wc=M5G9-SPN:345860401,345869501 : accessed 18 June 2015). Citing: Johann Majerus, wife Maria Trausch, son-in-law Johann Frantz, daughter Maria Majerus, granddaughter Maria Frantz. Front and back matter on images 516 and 518. Luxembourg Civil Records, Mamer > Mariages 1838-1890 Décès 1796-1880 > image 1412 of 1497. 1875 Death Record No. 13. (https://familysearch.org/pal:/MM9.3.1/TH-266-12143-119726-4?cc=1709358 : accessed 27 March 2010). Luxembourg Census Records, Mamer > 1875 > image 462 of 795. Johann Majerus household No. 29. (https://familysearch.org/pal:/MM9.3.1/TH-1971-32374-4220-81?cc=2037957&wc=M5LB-K6V:345860401,345870501 : accessed 18 June 2015). Citing: Johann Majerus, son-in-law Johann Frantz, daughter Maria Majerus, and granddaughters Maria, Katharina and Josephina Frantz. Front and back matter on images 461 and 463. Ibid. Mamer > 1880 > image 231 of 803. Frantz-Majerus household No. 65. (https://familysearch.org/pal:/MM9.3.1/TH-1951-32391-9005-98?cc=2037957&wc=M5G7-16N:345860401,345872201 : accessed 18 June 2015). Citing: Johann Frantz, wife Marie Majerus, daughters Marie, Catherine, Josephine Frantz, father-in-law Johann Majerus, sons Johann and Paul Frantz. Front and back matter on images 230 and 232. Ibid., Mamer > 1885 > image 41 of 829. Frantz-Majerus household No. 11. (https://familysearch.org/pal:/MM9.3.1/TH-1971-32390-5896-81?cc=2037957&wc=M5G7-GP8:345860401,345873701 : accessed 18 June 2015). Citing: Johann Frantz, wife Marie Majerus, children Josephine, Catherine, Johann, Pauline, Johann Peter, Marguerithe, and father-in-law Johann Majerus. Front and back matter on images 40 and 42. Ibid., Mamer > 1887 > image 715 of 828. Frantz-Majerus household No. 30. (https://familysearch.org/pal:/MM9.3.1/TH-1961-32393-787-37?cc=2037957&wc=M5GC-Y4J:345860401,345875201 : accessed 18 June 2015). Citing: Johann Frantz, wife Marie Majerus, children Marie, Catherine, Josephine, Johann, Pauline, Johann Peter, Margaretha, and father-in-law Johann Majerus. Front and back matter on images 714 and 716. Luxembourg Civil Records, Mamer > Décès 1881-1890 > image 93 of 144. 1887 Death Record No. 31. (https://familysearch.org/pal:/MM9.3.1/TH-267-12699-121161-49?cc=1709358 : accessed 22 August 2011). 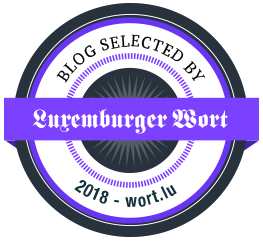 I have enjoyed reading about your Luxembourg ancestors. 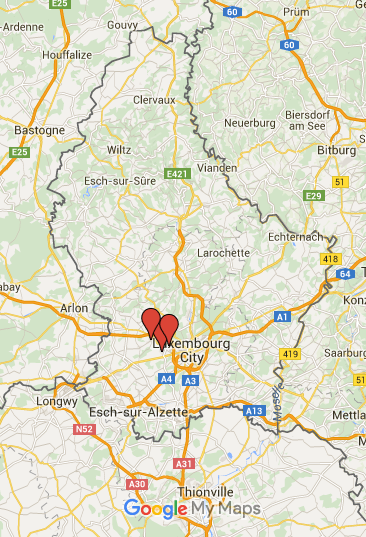 I have 2 great grandparents born in Luxembourg and am ready to dive in and research the records available there. I have looked for some information already and am glad multiple generations lived together. I hope to be able to travel there someday. Thank you Kathy for following along on my journey with my Luxembourgish side of the family. If you ever need help don’t hesitate to get in touch.